Natural stone brings out your home’s connection with nature. Exposed stone does something comforting to the human mind. A reminder that we’re all a part of the same natural world. Not every home has natural stone and those that do sometimes take it for granted. Just because we’re talking about stone doesn’t mean that it’s suddenly indestructible. Your natural stone countertops and floors will wear over time. Stones need cleaning to keep them in good condition, both visually and structurally. Even normal conditions can make your stone look less than appealing or hurt its structural integrity. So it’s important to regularly have your stone cleaned. This means hiring a reputable natural stone cleaning service. 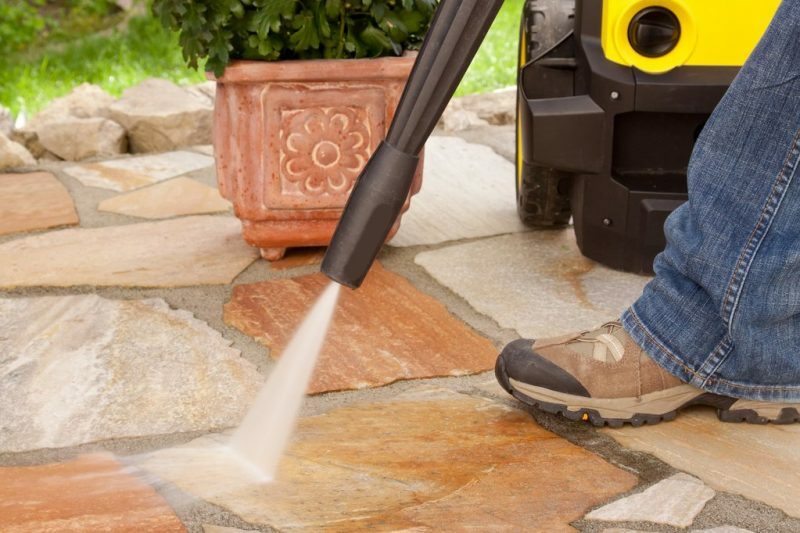 To help you get started we’re breaking down what to look for in a stone cleaner. Like when hiring anyone from any industry, it’s important that your chosen natural stone cleaner knows the ins and outs of the business. It’s surprising how many “professionals” don’t understand the basics of stone cleaning. Don’t get fooled by someone who thinks “cleaning” takes no effort. Calcareous: Calcareous stone is primarily composed of calcium, making it sensitive to acids (low pH levels). These stones include travertine, onyx, marble, and limestone. Siliceous: Siliceous stones are composed primarily of silicon dioxide, making them less sensitive to acids than calcareous stones. They include your common kitchen stones, like slate, soapstone, sandstone, and granite. So why does this matter? Well, depending on your stones’ composition, they’re sensitive to different cleaning agents. For instance, calcareous needs a pH-balanced, non-acidic cleaner like mild soap. Harsher chemicals could stain the stone or damage its surface, leaving it susceptible to cracks. Siliceous stone, being hardier, can withstand common kitchen cleaners and other harsh chemical cleaners. This works well in kitchen settings since your natural stone often sees stains from cooking and food preparation. Sealants work to keep things “out” or off of your stone surface. Say you spill water on your stone counter. The sealant keeps the water from absorbing into the stones’ pores and potentially causing long-term damage. Since natural stones have capillaries or pores that absorb liquids, sealants seep into the materials to keep out everything else (water, fruit juice, oil, humidity, etc.). Though not all sealants are created equal. Newer sealants don’t just penetrate the stone, but actually, change it on a molecular level. This means even harsh acids can’t penetrate your counters tops. Older sealants only keep out basic spills like water or wine. Make sure to ask your natural stone cleaner which type of sealant they’re using. The new versions are worth the extra cost. Stone is hard, right? Surely nothing can scratch up stone counters or other natural stone fixtures. Well, that’s a wonderful idea, but unfortunately, it isn’t correct. Stone is actually more susceptible to surface damage than most people believe. Abrasive cleaners can strip away your sealants at best, and at worst etch the surface of your natural stone. It’s important to remember that your counters might have an older sealant, making it even more vulnerable to abrasive material. Make sure that your chosen service isn’t using abrasive tools during your natural stone cleaning. It helps to ask if they’re aware of stone hardness, and what materials can damage each type of stone. Experienced stone cleaners have a few tricks up their sleeve that the rookies won’t. For instance, ask the cleaner if it’s important to sweep your stone floor. While partials will come up with the mop, they can also scratch the stones. Likewise, little things like brushing counters in small circles can prevent micro-scratching caused by vigorous one-direction cleaning. Reviews are the best way besides interacting with a company to determine if they’re right for your natural stone cleaning needs. And it doesn’t matter where they come from. Neighbors, Yelp, Google Reviews, anything helps. Make sure you’re asking all the right questions when going about your review process. This means prices, how long it took, were the people friendly etc. In fact, you should go through an extensive research process before ever contacting a company. Talk to your friends who’ve used local cleaning services. Or, check the internet. However, do remember that many people are more inclined to post negative reviews, not positive ones. Take every review into account. Happy customers don’t leave as many reviews as angry customers. It’s also worth noting if the company replies to reviews. This can indicate that they really value your business. Using local business has more benefits than just bringing money into the local economy. When you choose local, you’re dealing with someone whose reputation is on the line. National companies have established markets. They already work in large markets and don’t have to worry about burning bridges with local consumers. If the market in Philly isn’t strong, they’ll just look at New York. Local businesses, however, only have their local consumers. They’ll go above and beyond to make sure your needs get met. Plus, they have a vested interest in seeing the community happy. After all, they’re your neighbors. Choosing someone for your next natural stone cleaning, or any other home cleaning service means understanding the service you’re hiring for. That is, knowing the ins and outs of stone cleaning or carpet cleaning. Understanding a process yourself is the easiest way to make sure your chosen company is the best around. Hopefully, our list above can give you some more insight into how to choose the best natural stone cleaners. Follow our above steps and we’re confident you’ll find the best service in town. So if you are looking for a natural stone cleaning service, get in touch with us. Our experts know stone and would love to show you how best to clean it. We’re here to make your house shine!